Asked if he could see McIlroy coming world No 1 at some stage in the future, Woods said: “There's no doubt. There's no doubt. The guy's a talent. Hopefully while I'm not around, or while I'm around. “Certainly he has the talent. We can all see it: The way he hits the golf ball, the way he putts, the way he can chip, get up‑and‑down. “He has the composure. He has all of the components to be the best player in the world, there's no doubt. The 14-time major winner carded a four under par 68 in the CA Championship at Doral that left him eight shots adrift of on-course leader Nick Watney on seven under par. But as Woods was speaking, McIlroy chances of becoming the youngest winner in the history of the PGA Tour suffered a blow when he missed too many fairways and bogeyed the 14th, 15th and 17th to card a level par 72 and go into the final round six shots behind leaders Phil Mickelson and Nick Watney on 10-under par. After a birdie at the first and a bogey at the short fourth, where he was bunkered, the teenager birdied the fifth and 10th to get to within three shots of Watney on 12 under par. A birdie at the 13th left him just one stroke out of the lead but he fluffed a pitch at the 14th, failed to get on the green with a bump and run pitch with a five wood at the 15th and then fluffed another pitch at the 17th to fall back to tied 10th. In the end, Mickelson hit a three under par 69 to share the lead on 16 under par with Watney, who shot a 67, with Jeev Milkha Singh and Camilo Villegas four shots behind on 12 under. 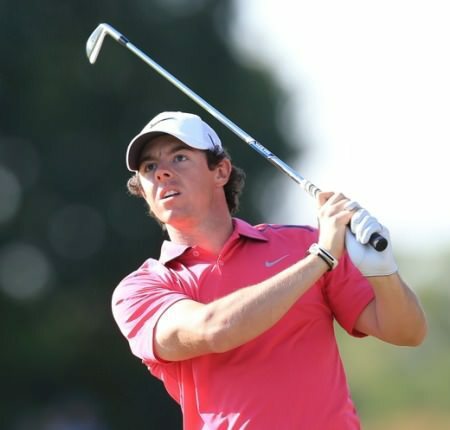 "It was a pretty difficult day out there and I thought I was doing very well, three under through 13 was a good score but I just let a few slip at the end," McIlroy said. "I hit a bad drive at the 14th and got away with it and just missed the green to the right and had a terrible lie. It could have been better but I am still there or there abouts." Asked if fatigue was a factor after three weeks in the US, he said: "Not really, it shouldn't be. I have been trying to conserve my energy and doing as little as possible to be honest. All my practice sessions have been quality rather than quantity, I haven't hit many balls. It has been a great three weeks but it would be nice to shoot a good one tomorrow and head home for a couple of weeks. "I do (feel I have a low one in me) but it looks like it is going to be a bit of a two horse race. But if I can go out and shoot in the mid 60s - 65- and get myself as high up the finishing leaderboard as possible, then it will have been another good week." Padraig Harrington's fading hopes of challenging for the title suffered a major reverse when he double bogeyed the 17th and signed for a 71 that left him eight shots of the pace on eight under par. But he was still pleased that he decided to make an unscheduled visit to Miami to get competitive rounds under his belt as he tries to win three majors in a row at the Masters in four weeks' time. "I didn’t drive it very well again," said Harrington, who hit just six fairways in regulation. "But I had a lot of chances for birdie in the middle of the round. I certainly had reasonable chances to shoot say 68. "I am definitely getting out of it what I hoped. It is as expected. " The reigning Open and US PGA champion got up and down for birdies at his first two holes before failing to save par from the bank of the lake at the par-three fourth. He bounced with birdies at the short ninth and par-five 10th but failed to get up and down from a bunker for his birdie at the par-five 12th. He kept his round going at the 14th, where he holed an 18 footer for par after driving into sand off the tee. But he paid a high price for another bunkered tee shot at the 17th and could only move the ball into the rough from where he overshot the green and took three more to up the ball in the hole. Darren Clarke played bogey free golf until he three-putted from 36 feet at the last for a 71 that left him on even par for the tournament. But as a Liverpool fan he was a lot happier at the end of his round when he heard the result of the game at Old Trafford (ManU 1 Liverpool 4) than Manchester United mad Graeme McDowell, who bogeyed the last two holes but still had his best round of the week - a two under par 70 - for a one over par total. As for Woods, the American was pleased with his just his third strokeplay round since he won the US Open at Torrey Pines nine months ago. Woods said: "I hit it great today. I hit it the best I've hit it in a long time. Granted, I haven't played in a long time, but still. With a five weeks to go before the Masters there's just one thing consistent about Tiger Woods and Rory McIlroy — their inconsistency.